parts of the world. It wasn't even the first comic book in America. Several U.S. publishers had put out reprints of newspaper comics, and there had even been publications devoted to original comics material — in fact, Dan Dunn, who maintained a presence through most of the 1930s, started out in one. But it was the first that a modern reader would instantly recognize as a comic book. It was a fraction of an inch wider than its latter-day cousins (publishers saved money by shrinking them a little) and about twice as thick (for years, publishers responded to inflation by dropping pages rather than raising prices); and the paper and printing technology have certainly improved since then. But the modern comic book is a linear descendant of Famous Funnies, and still packaged in the same basic format. But that wasn't Gaines's most important innovation. What he did, which nobody at the company had ever tried before, was to take a stack of comic books that didn't have promoters' names printed on them, stamp "ten cents" on the covers, and get a couple of local newsstands to offer them for sale on a trial basis. The result may or may not have convinced an occasional visionary that a new industry was born, but it was encouraging enough to warrant further exploration. Famous Funnies, without the sub-title, became a monthly publication with the price printed right on it. The cover date of #1 was May, 1934. Shortly after the monthly began, Eastern cut Gaines out of the deal and kept the comic book for itself. Gaines responded by partnering up with McClure Syndicate (which later brought the infant industry's first big hit, Superman, to newspapers) to publish comic books of his own reprinting Moon Mullins, Don Winslow of the Navy, Alley Oop and many others; and suddenly Famous Funnies had competition. The success of both ventures attracted pulp publishers such as Martin Goodman (Marvel Comics), printers such as Harry Donenfeld and Jack Liebowitz (DC Comics), established comics producers such as King Features Syndicate, and other entrepreneurs; and within a few years comic books, in the format pioneered by Famous Funnies, had become firmly established as a branch of the U.S. publishing industry. dozens, if not hundreds of famous funnies cavorted through its pages over the years. 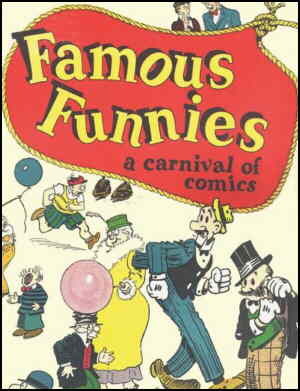 Famous Funnies outlasted most of its comics-reprinting competitors, including Popular Comics (Smilin' Jack, Terry & the Pirates), King Comics (Popeye, The Little King) and Sparkler Comics (Nancy, The Captain & the Kids). But the market moved away from anthology comic books in general. Eastern Color Printing took the 1950s slump in comic book sales as its cue to get out of the industry. The final issue of Famous Funnies was #218, dated July, 1955. Text ©2004-10 Donald D. Markstein. Art © Eastern Color Printing.